A couple of weeks ago it was my birthday! The day after, Edd and I wanted to go for a special meal together. We'd both been keen to try out the new Mediterranean restaurant. I'd attended the launch party but wanted to try some more food from the menu. 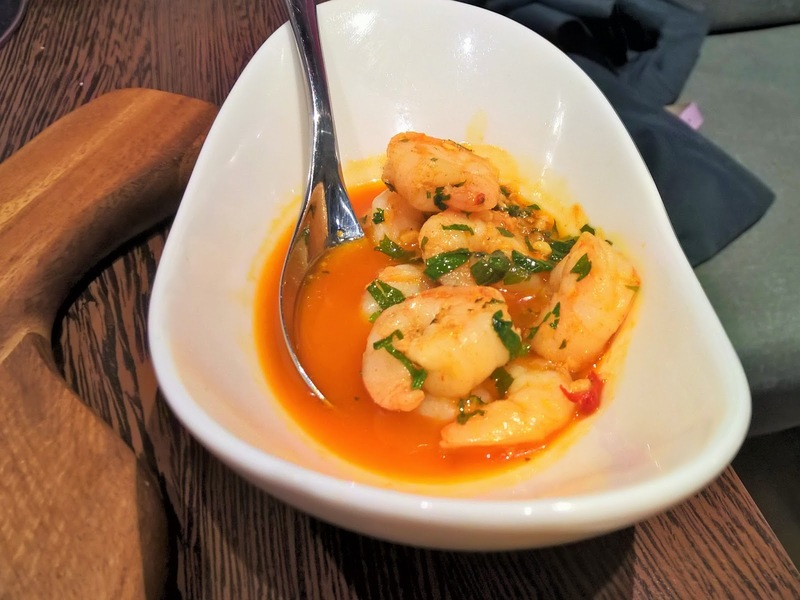 Amantia isn't your usual Spanish restaurant. No terracotta tiles and patatas bravas here! Of course there is a place for the traditional but it's great to see someone doing something different. Amantia's menu is a mix of contemporary tapas and Mediterranean main dishes. We decided to go for tapas because it all looked so delicious and we love small plate style eating. We ordered a couple of G&Ts made with Spanish Gin Mare and garnished with lavender. It's a really unusual gin and suited the food we were about to try. Pulpo a la Gallega. 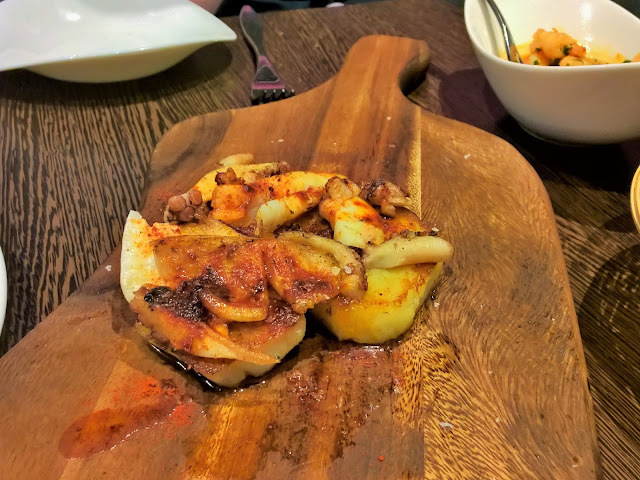 Beautifully cooked octopus and potatoes in an olive oil dressing. Simple but delicious. One of my highlights of the evening. Gambas al ajillo. Probably the most traditional dish we went for. Well I just love prawns! The prawns were well cooked with a good bite to them, and the garlic white wine sauce was delicious. Datiles con bacon. 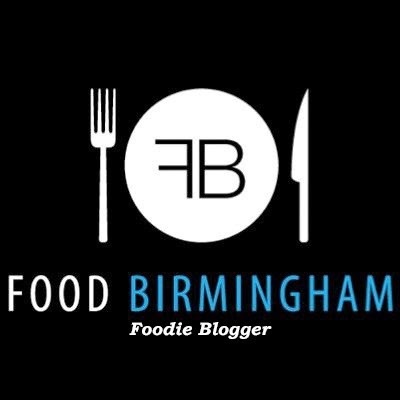 I've talked about these before on the blog. 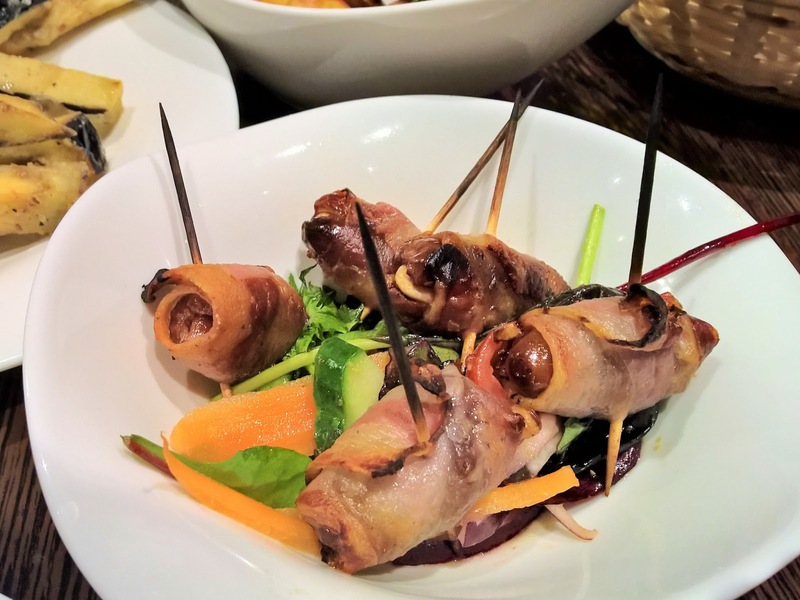 Dates stuffed with an almond wrapped in bacon. They've got to be tried to be believed. I love them, I wish there were more on the plate! Berenjenas con Miel. 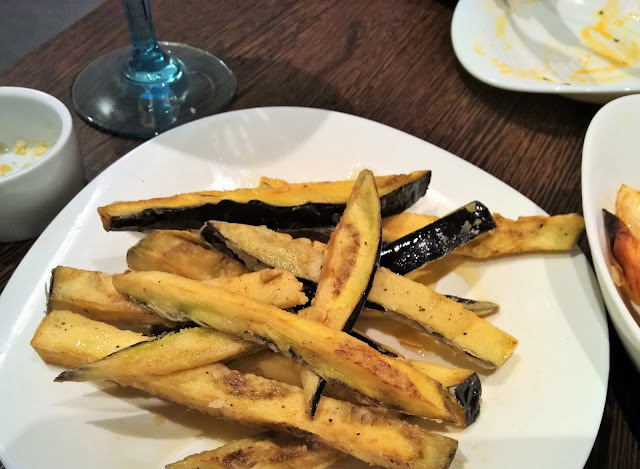 Just battered aubergine chips drizzled with honey. Simple but effective. Delicias de Sobrasada. 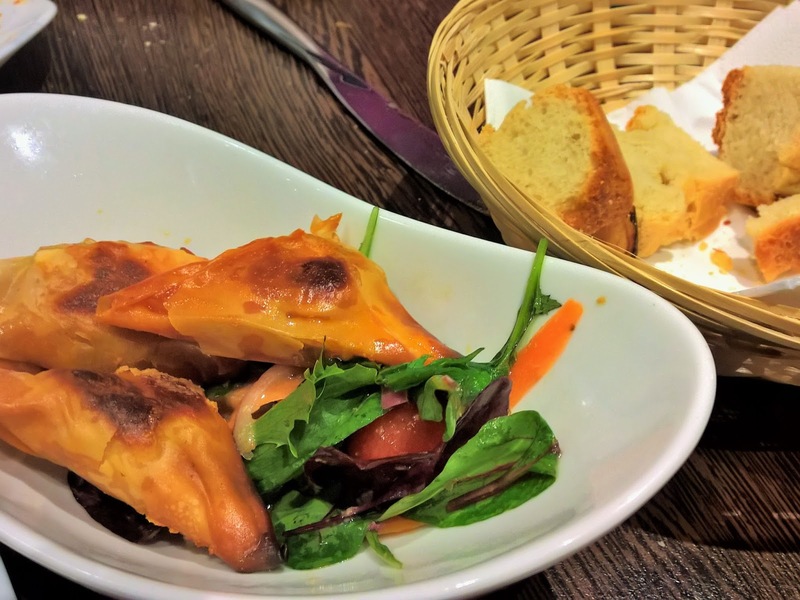 Filo parcels stuffed with chorizo paste and goats cheese. Well you can't go wrong with chorizo and goats cheese, a classic combo. Atun marinado. 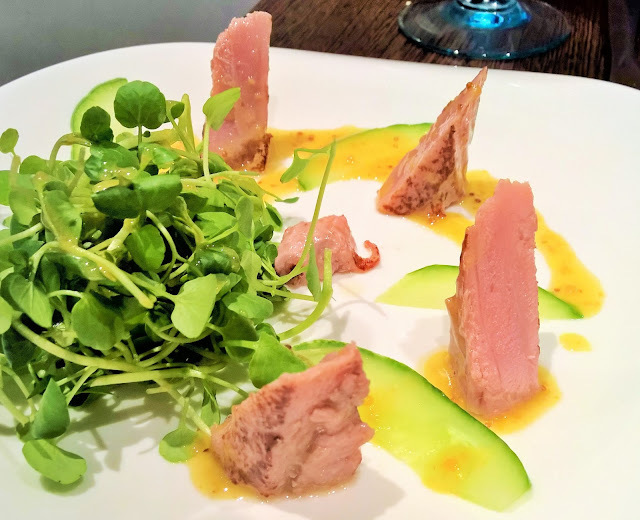 Sashimi grade tuna, seared and served in a beautiful mustard sauce. The tuna was beautiful and melted in the mouth. A glass of sangria each and we had some room for pudding. 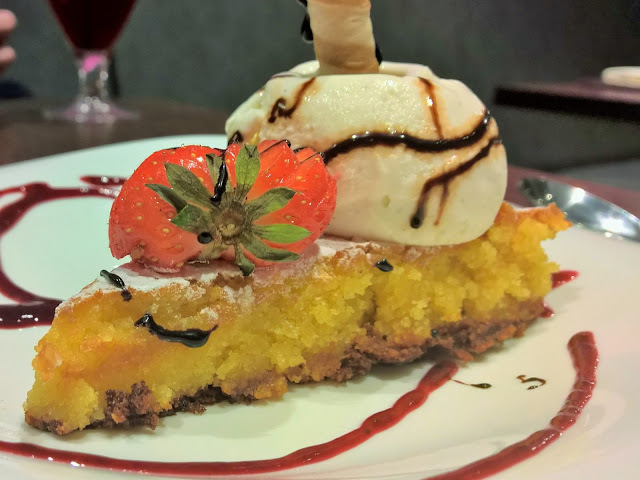 Tarta di Santiago. Edd went for the traditional almond cake. 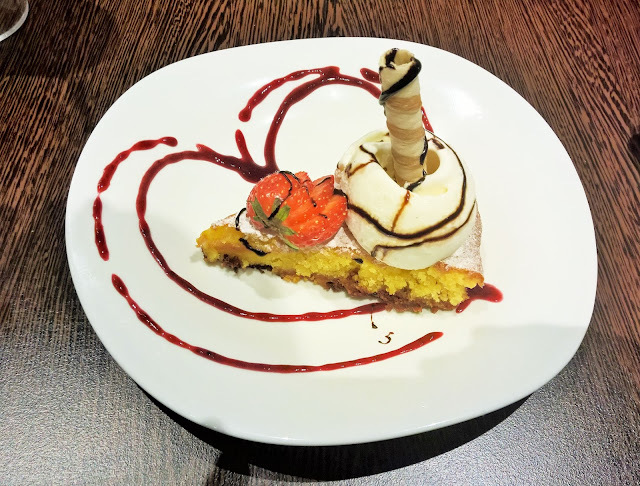 As you can imagine with ground almonds, the cake was beautifully moist and the ice cream was an extra treat. 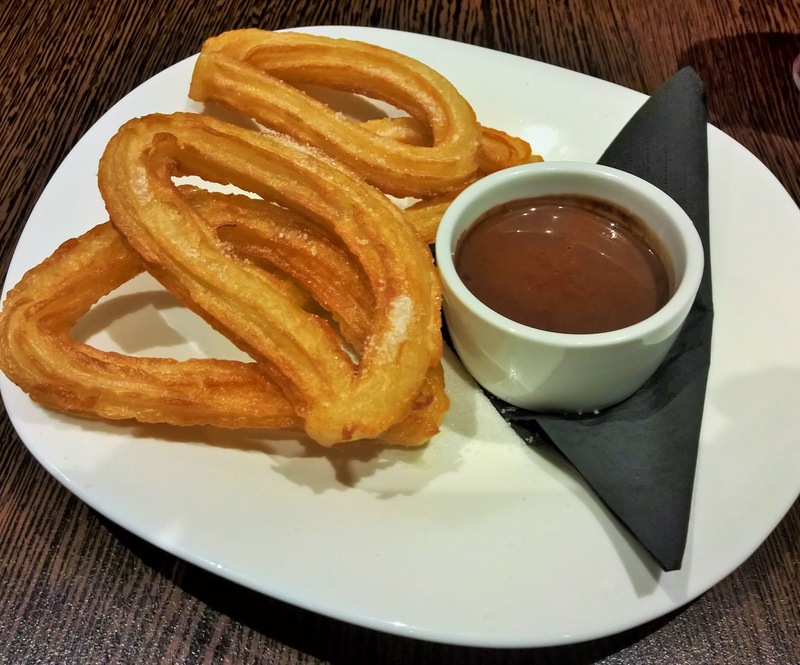 Churros con chocolate. I went for churros. I wouldn't usually in a restaurant but I just fancied them. Ooh they were lovely. Hot, soft, sweet dough with a crunchy outside and rich chocolate to dip them into. We had a lovely evening at Amantia. The staff and management are super friendly and enthusiastic, the food was obviously Spanish but with a contemporary twist and there's loads more on the menu we want to try! We'll definitely be back.